A 2 day trip to Foz do Iguacu, to visit one of the seven natural wonders of the world- Iguacu Falls and the technology Wonder Itaipu Dam. This monster of a waterfall with Jaw dropping sights consist of the power and noise of the chains of hundreds of waterfalls nearly 3 km in extension.IndiZil tours offers you a day long visit to the waterfall and also visit to the other top destination which includes Itaipu Dam, 3 borders point(Argentina,Brazil and Paraguay) and a beautiful bird park. We will enter into the iguacu waterfall park in the morning around 9-10 am and will be out by 3-4 pm. This waterfall deserves at least 5-6 hours to enjoy the complete view of the waterfall.We will be walking through a special trail which is parallel to the waterfall and hence provides us the view of the waterfall right from the start till end. Enough time will be spent near the Devil's throat which is the best spot in Foz do iguacu waterfall. The marco das tres fronteiras is the three borders mark point in Foz do Iguaçu you can stand at the unique meeting point between Argentina, Brazil and Paraguay. 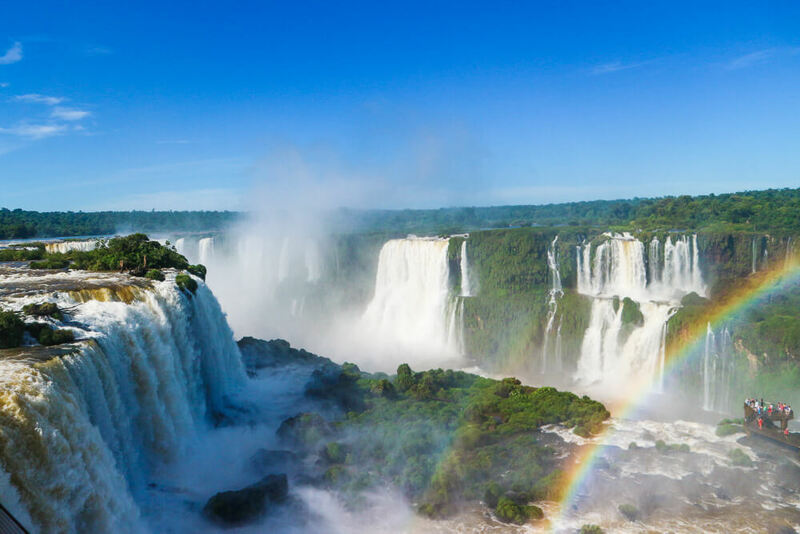 As the Iguazu River flows down from Iguaçu Falls it converges with the Paraná River to form one of only a few places in the world where two rivers create a border between three nations. We will be visiting the Brazil side of this point around 5PM and will spend at least an hour to enjoy the view. Slowly turning out to be one of the top destination in foz, this duty free shopping situated in Brazil-Argentina border offers you to purchase wide range of products for a cheaper price. We will visit this place by 7pm and come out by 9pm. It is an hydroelectric dam on the Paraná River located on the border between Brazil and Paraguay and is considered as the one of the technological wonders of the world.We will do a panoramic view tour which starts around 9 am and ends by 11 am. The Bird Park (Parque das Aves) is an Integrated Conservation Center for Birds of the Atlantic Forest and the second most visited attraction in Foz do Iguaçu, where visitors can have close contact with Atlantic Forest birds in immersion ponds during a walk that connects the contact with nature and knowledge. Located near the Iguaçu National Park, where the Iguaçu Falls lie, the Bird Park is one of the largest bird parks in Latin America, whose main job is the conservation of the 120 species of birds of the Atlantic Forest in some danger of extinction. We will enter by 12 pm and leave by 2PM.